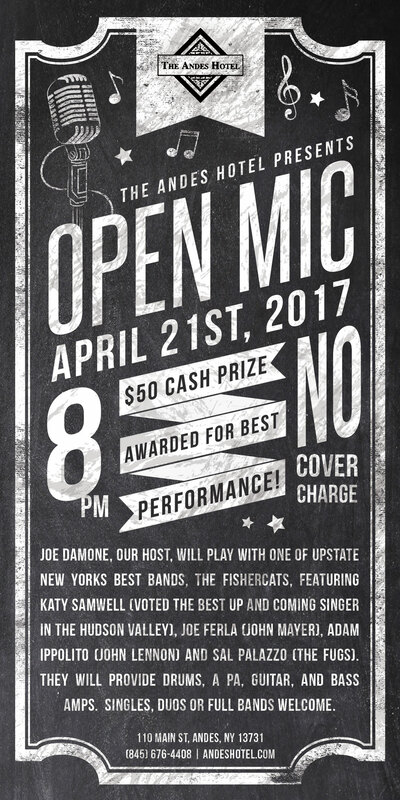 Joe Damone, our host, will play with one of upstate New Yorks best bands, The Fishercats, featuring Katy Samwell (voted the best up and coming singer in the Hudson Valley), Joe Ferla (John Mayer), Adam Ippolito (John Lennon) and Sal Palazzo (The Fugs). They will provide drums, a PA, guitar, and bass amps. Singles, duos or full bands welcome. $50 cash prize awarded for best performance.